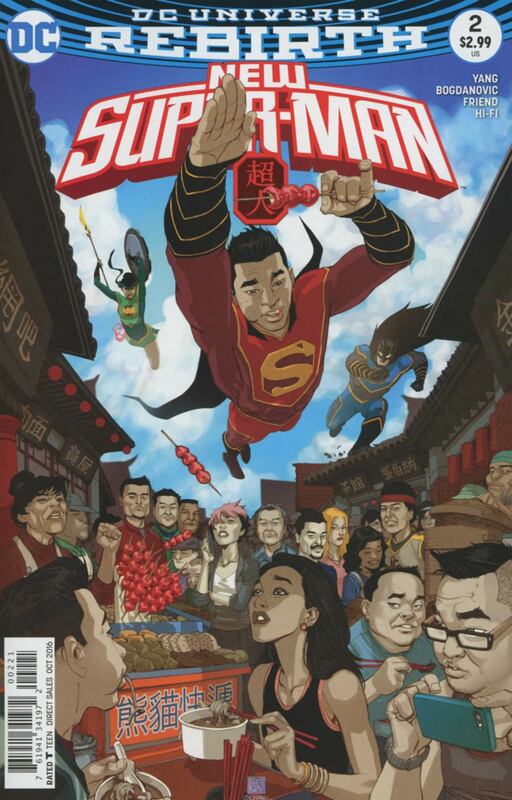 The Bat-Man and Wonder-Woman of China attack Kenan Kong, the new Super-Man of China. But while attempting to fight back, Kenan realizes that he has lost his powers. Wonder-Woman uses her lasso which, according to her is like an extension of her own skin, to subdue Kong. Bat-Man tasers him, knocking him out. Kong wakes up and tries to call his father, but Dr. Omen snatches the phone and uses voice manipulation to pose as Kenan and reassure his father that he is fine. Omen tells Kenan that he cannot go home until he is properly trained. His powers are still gone so she gives him a visor to wear which will protect people and property from a stray blast of heat vision should it manifest itself unexpectedly. The visor is not only an eye shield, but a shock collar of sorts that will not come off in order to keep him in line. After getting his Justice League partners in, Kenan is ordered to stay in the BUV or Bat Utility Vehicle. If he steps one foot out the door, his visor's stun feature will activate. But with the showdown between the JLC and Sunbeam is at a stalemate, Kenan leaves the vehicle despite the visor continually shocking his head. He takes Sunbeam off guard, saving the day. But the villain stands over him and blasts the powerless Super-Man in the head. As luck would have it, Kenan's powers return and he is unharmed. Wonder-Woman uses her lasso to capture Sunbeam. As things wrap up, television journalist Laney Lan runs to the scene. Kenan wants recognition so badly, with Laney's cameraman sending out a live feed, he impetuously rips off his visor and reveals his secret identity to the world. 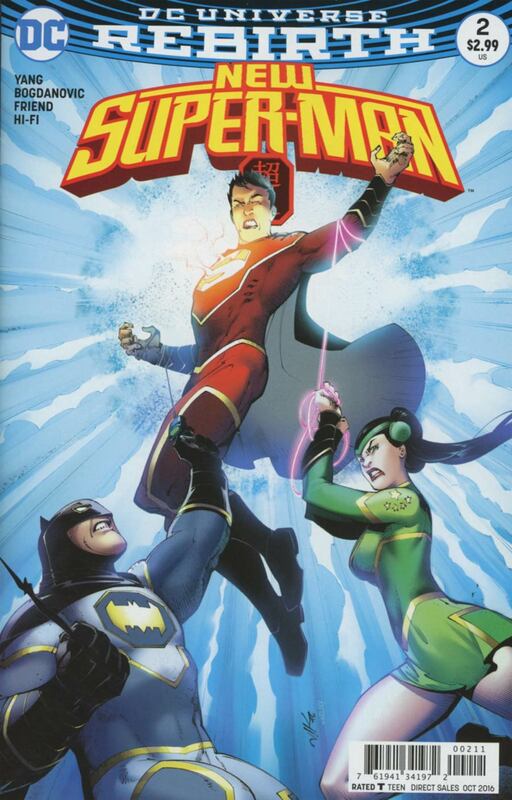 Story - 4: The first five pages of this issues contain a fight between Super-Man and the only other two members of the Justice League of China. Predictable, I suppose, but it would have worked fine if Kenan had his powers. Since he did not it was a waste of pages. Yang would have been better served using that valuable space to build this new world. We could have gotten a tour of the Oriental Pearl Tower, or been given teases of potential future JLC members. But perhaps most importantly, Yang could have teased out a lot of questions that are (too) slowly starting to build. For instance, the team which our hero, Kenan Kong, belongs too is ran by a secret division of the government. Kenan's Father paints this Ministry of Self-Reliance as a villainous anti-democratic shadow cabinet. Does that mean that Sunbeam is not a Super villain, but hero? What is Dr. Omen's ultimate goal? How deep does the conspiracy go? How will China's Great Ten be involved? Even the subsequent six or seven pages are merely a set up for the final scene. Kenan willingly endures great pain to save the day. On the upside, we see a quick flashback and a glimpse at the part of Kenan's past that will largely shape his path to becoming a hero. The surprise reveal at the end is great. It is emblematic of the story world that Yang is building as a whole. As it is a familiar trope, but because the culture is so different it still leaves readers to wonder where it is all going. I hope the ID reveal has significant implications. Might Kenan or his family have to hide from the government? Or will he be used as a propaganda tool? Wherever the story is going, I hope that the reveal was not done simply because the writer believes the idea of a secret identity to be passé. To my pleasant surprise, the first issue made the top ten in sales. Let's hope Yang can keep readers interested. This issue is a fine effort, but it still needs a little bit more meat on the bone. Art - 4: As with the first issue, Bogdanovic does a good job on character design. Sunbeam looks great. The art team does a well in setting the mood in each scene with shading and set pieces, along with a great job on colors by the team at Hi-Fi. Most monthly comic art will always need a bit more detail and care, but the bigger problem here is action shots. Bogdanovic's characters move in an awkward way, particularly when fighting. All in all, though, the team does a job, far above average. Cover Art - 3: The cover is accurate enough when compared to the interiors. But I think it could have been more dramatic. Super-Man on his knees writing in pain with the shock visor on his face while wrapped in Wonder-Woman's lasso as both the JLCers stand over him. I don't normally like to see Superman "losing" on a cover, but since these are different characters and we are not yet sure how they will relate to each other, presenting Batman and Wonder Woman as a serious threat would work.